With Monsieur Le Chic laid low back in our hotel with the flu and Mlle, our daughter, at work I found myself alone one day on our recent London trip wondering how to fill in my time! I didn’t feel inclined to go shopping (and my luggage allowances and credit card wouldn’t have thanked me) and I’d already had a walk round one of the local parks near our hotel earlier in the day. Since Mlle was heading down to South Kensington for work anyway, I decided to tag along and take up her suggestion of visiting one of the many museums in that neighbourhood. The area in the Brompton District (part of the London Borough Of Kensington and Chelsea) has taken on the moniker of “Albertropolis” owing to its close association with Prince Albert, the consort of Queen Victoria. A passionate supporter of scientific research, design, technology and the arts, Albert was instrumental in encouraging the foundation of many of the museums that you find today in the area including The Natural History Museum, The Science Museum and the one that bears the royal couple’s name, The Victoria and Albert Museum (now usually just abbreviated to the V&A). I wandered in from the Cromwell Road entrance, my eye caught initially by the large poster advertising, “Savage Beauty” the retrospective of Alexander McQueen’s work (more about that later!). I can remember previous visits to both the Natural History and Science Museums and I’m sure in the dim and distant past I must have been to the V&A but apart from seeing their wedding fashion collection when it was on loan in Perth at the Western Australian Museum a couple of years back, I couldn’t remember much about it. 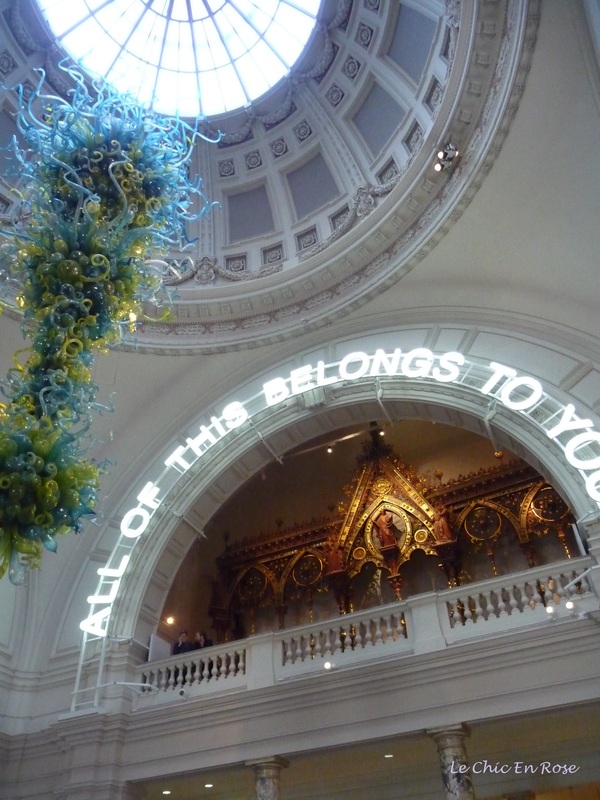 The V&A styles itself as the “world’s greatest museum of art and design”. It has an enormous collection of design work and textiles, runs classes for school children, university students and mature aged students and promotes the preservation of ancient treasures along with cutting edge designs be they in art, sculpture or fashion. In short it has a vast collection, to which you couldn’t possibly do justice in one visit. However, like other national British museums, entry to the V&A has been free since 2001 so you can spend as long or short a time here as you like without feeling you haven’t got your money’s worth. Free admission doesn’t apply however to special exhibitions, so since there was a sizeable queue to see the Alexander McQueen retrospective, I decided to take myself round the free collections first in no particular order. There were no restrictions on taking photos in most of the collection areas apart from the special exhibitions. I loved the inscription high on the arch above the entrance foyer, “All Of This Belongs To You”. You really feel as if they wish to engage their visitors as much as possible and highlight their important preservation work and promotion of arts and design. I wandered through “Religious Sculptures in Europe” from the Middle Ages and Tudor times. Then I set off to explore Asia. I admired beautiful porcelain and antiquities from the Middle East as well as many fascinating Indian artefacts. Please excuse the quality of the photos! The light was rather dim and many of the photos were taken through glass so it was the best I could do. Certainly the photos don’t do justice to the magnificent colours and designs of many of the exhibits. I’ve tried to convey the impression of what it was like wandering around. I’m certainly no expert on the vast array of artefacts and exhibits I saw – I just viewed the items that caught my eye the most! My favourite pieces were the costumes and fashion items. There were some lovely exhibits in the Indian section and a whole section devoted to the history of fashion, which had me enthralled (and would have bored Monsieur Le Chic to tears!). Here are some of the highlights! Many of the dresses looked exquisite but must have been impractical to wear – I mean how could you even sit down in this one? Plus what tiny waists the ladies had in the 17th and 18th centuries! 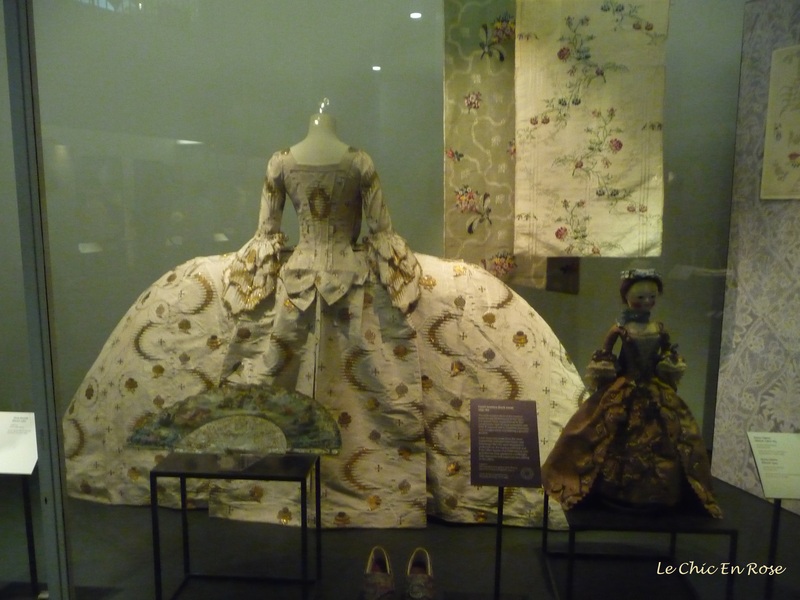 The V&A also has a large collection of textiles and the attention to detail in all the exhibits is superb. Having spent a pleasant couple of hours wandering round the general exhibitions I found myself back in the foyer area again and noticed there was no one queuing at the desk. I casually enquired whether there were any tickets available for the Alexander McQueen special exhibition and was in luck as they hadn’t (most unusually) sold all the allocated tickets for the day. I hadn’t realised that people had booked ahead for months to see the “Savage Beauty” retrospective so I was incredibly lucky! “Savage Beauty” is an apt description of McQueen’s work – some of the work was quite confronting and at times even disturbing. He was clearly a complex and tortured soul. However the quality of his tailoring and workmanship was amazing – to be able to see his garments (every collection was featured) up close was a real treat. As I said earlier photography was strictly forbidden in the special collections (and enforced when a couple of people broke the rules!). Hence the only way I could illustrate it is by showing you some photos of the postcards I bought in the shop afterwards. My highlight was the beautiful tailoring of the “Widows Of Culloden” collection with gorgeous tartan and lace garments (some of them were almost wearable and have certainly filtered down into mainstream fashion). The original runway show had ended with a hologram of Kate Moss in a floaty white gown being beamed onto the stage making her look like a ghost – we saw a film of this ethereal image, which was a standout feature of a wonderful exhibition. There are just a couple more days to go before “Savage Beauty” closes (last day Sunday 2 August 2015) so anyone in London this weekend might be able to pop down there to take a look – you never know there may still be a few tickets available! The porcelain and antiquities are very beautiful The Middle Eastern collection reminded me of Morocco. I just love the colors and the energy the items have. It looks like a wonderful museum. Glad you had fun. Lots of hugs! The is exactly what I would do with a free day in a major city–find an art museum! 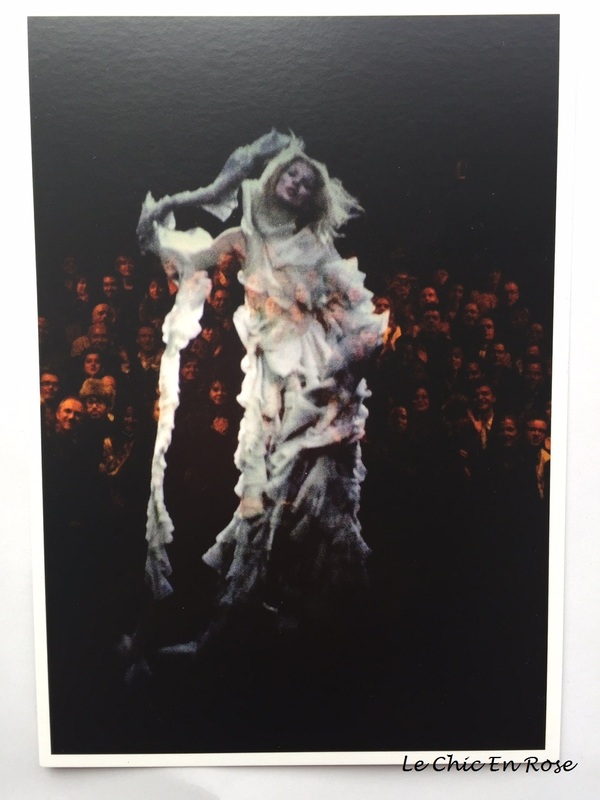 And how wonderful that you got to see Savage Beauty–I’ve been hearing great things about that show! So envious you got to see Savage Beauty Rosemary – I was longing to see this exhibition but we just never got around to it. Love the look of the V&A as well, never been there – another one on the yet to see list – we’ve been to the Natural History and Science Museums though numerous times and absolutely love those. The fact there is free entry is something I’m very grateful about in this country!! I contributed a small amount to the crowd funding for the Wolsey Angels, so it was lovely to see them in your photo. The V&A is fabulous and you’ve given a good impression of its range. 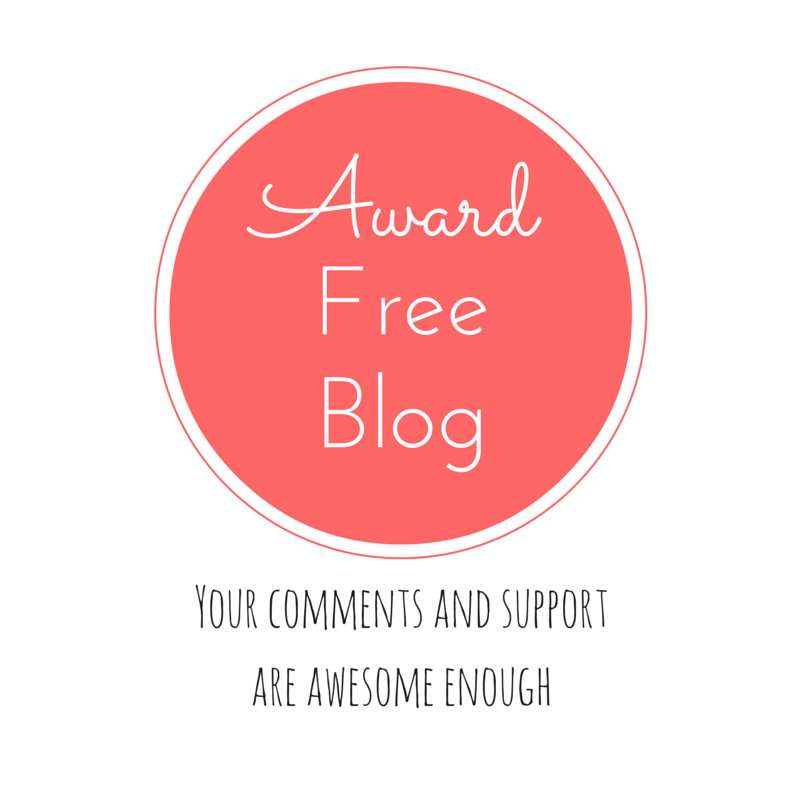 You’re very welcome! The museums and galleries in London are superb – such a great national resource and wonderful places for visitors! Your capture of the entry foyer to the V&A museum is magnificent. I love the angle. Perfect. Well done. And how lucky were you to get into the McQueen exhibit. Too bad you couldn’t take photos (although the postcards were incredible – especially that Kate Moss). I didn’t know of the exhibit until I read about it here, but now I wish I could go as you made it sound so interesting. Sadly, I will be home long after it closes. I thought the images that you took of the other exhibits came through very well in spite of the glass. The Courtiers’ Dress images were my favorite. Beautiful, albeit not the most comfortable attire.